The CBSE Board 10th Result 2018 will be announced tomorrow on 29 May 2018. 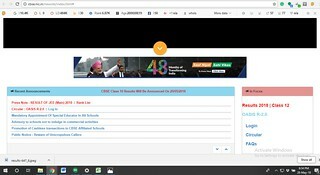 According to the official web portal of the Central Board of Secondary Education, the CBSE Class 10th Result 2018 will be released on 29 May. However, according to some reliable sources, the result will be announced at 4 p.m. The Board has already announced the CBSE 12th Result 2018 on 26 May. 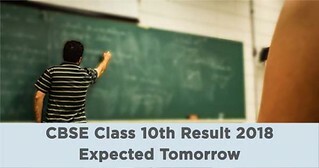 According to previous years’ trend, the CBSE Class 10th Result is declared 3-4 days after the declaration of the CBSE 12th Result. The CBSE Class 10 exam has been conducted successfully by the board from 5 March to 4 April 2018. Around 16,38, 420 students reportedly appeared for the CBSE 10th exams this year. Last year, the CBSE 10th Result was released on 3 June 2017. CBSE Class 10 Result can also be checked via SMS. For this, the candidates need to type cbse10, give a <space>, type <rollno>, <sch no>, <centre no.> and text the message to 7738299899. This service will be available subject to a deduction of Re. 0.50 per message. Under Interactive Voice Response, the students will be able to check the results by calling subject to deduction of Re. 0.30 per minute for every 1 minute. With the introduction of accessing the result through Google Search and SMS Organiser App of Microsoft, the students will be able to check the CBSE Board Results in an easier and hassle-free manner. However, the access through Google App will be live for a lesser duration as happened in the case of CBSE 12th Result 2018 (which remained, live for just more than an hour on 26 May).